To date, I think this might be my only paying customer, or at least my only paying freelance gig. This one was fun to build, and is fun to revise from time to time. The intent was to create something that was easy to maintain for someone not very experienced with HTML. 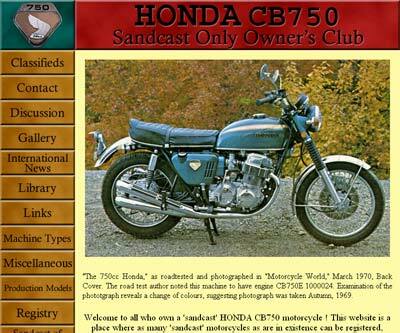 That someone was Steve Swan, a man very passionate about Honda cb750 Sandcast motorcycles, who came to me in late 2004. I think it turned out well, and I hope you like it. It might be a bit overwhelming to anyone that doesn't restore this particular breed of motorcycle, but still full of interesting information and stories if you have the time. All artwork Copyright © 2004 Nathan Edward Williams. All rights reserved.